Translation Services 24 UK offers fully accredited and legally certified translations of marriage certificates in over 200 languages. Our marriage certificate translation service is fully certified for legal usage and accepted by authorities such as the Home Office or Courts of Law. We translate the certificate and match the layout and look of the original document. Whether you have moved to the United Kingdom from abroad or were lucky enough to have your marriage proceedings on a paradise island, and your documents are in a foreign language, or need your English certificate translated into another language, our marriage certificate translation service will professionally adopt your documents to or into one of the 200 languages we cover, keeping the original look of the marriage certificate and officially certify the document, ensuring that it is accepted and recognised by legal authorities. Fully recognised by Home Office, courts etc. To make an inquiry or to follow through with your marriage certificate translation email info@translationservices24.com where a member of our projects team will respond within minutes. 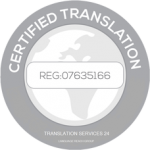 Certified Translations do not have to be complicated and expensive. So we understand that and translate a standard marriage certificate within 24 hours of receiving the document. You may scan and email over your document to save time. Once translated we initially email back the translation and certified letter. We will also send out a first class copy in the post which will be fully stamped and signed by our management team. You may email/ send your certificate to info@translationservices24.com or alternatively give a member of our team a call on 020 8677 3775, we look forward to hearing from you.